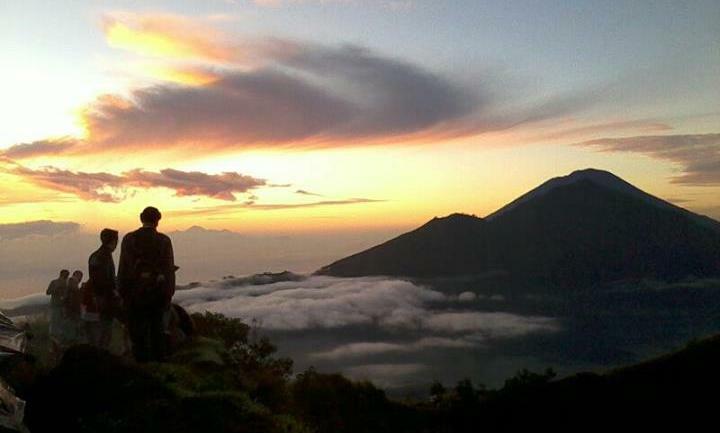 Bali Volcano Trekking Adventures located in Kintamani is one of the most actively promoted attractions in the island of Bali now days. It is a vast mountain an eruption of massive proportions blew off its top leaving a huge caldera in which three peaks are located. One is the active volcano of Batur and the other is the non-active of Batur Caldera. The uniqueness of the area’s characteristic is a reminiscent of a moonscape rather than anything related to the earth offers such breathtaking experiences, like observing sunrises and gazing into the volcano’s crater. 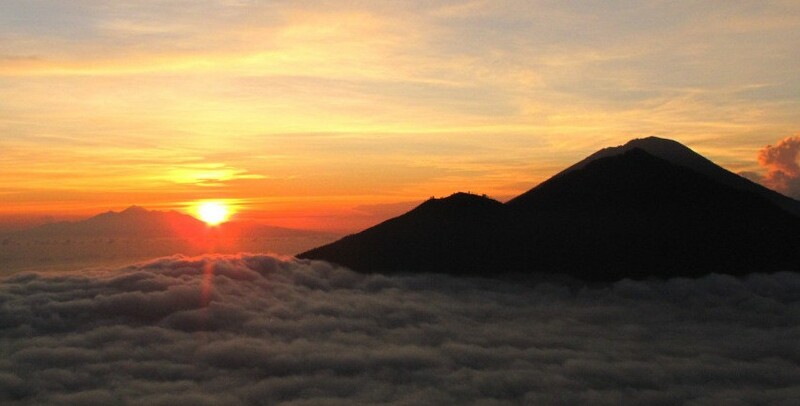 Both Mount Batur and Caldera Batur is the most trekked mountain in Bali. They provide very easy climbing experience in Bali. What the adventure look like? Bali Volcano Trekking Adventures will be started from pick you up at your lobby hotel, and then we will drive you to the starting point located at Pura Jati Temple in kintamani. Meet and great your Volcano Trekking Guide. Simple and helpful briefing will be given by our Selected Volcano trekking Guide to assure that your Volcano Trekking Trip is safe and comfortable. From start point until on the top of volcano will spend about 2 hours hiking. 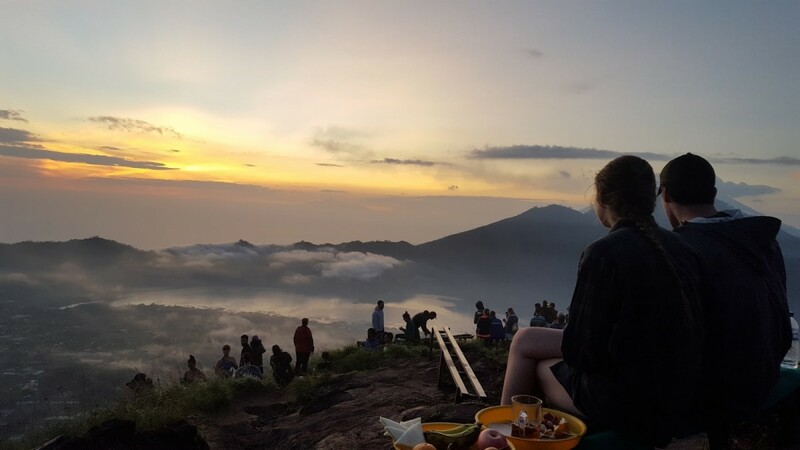 On the top While waiting for the sunrise you will have a simple breakfast, than overlooking the majestic view of Lake Batur and Mount Rinjani. 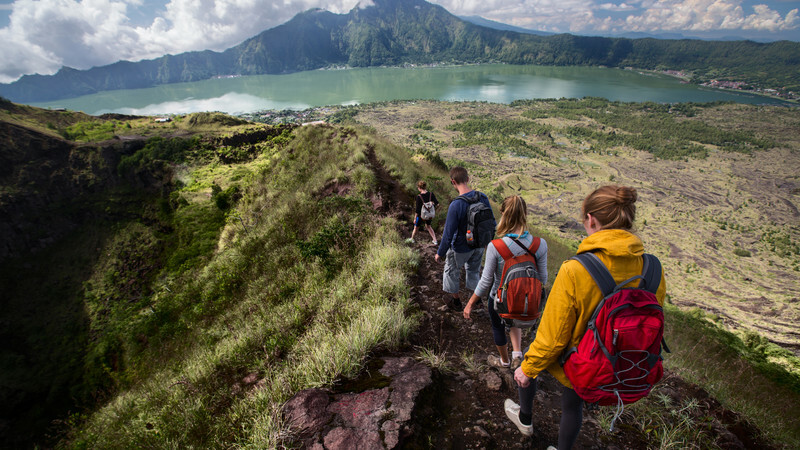 The trip will be continued to explore a deep cave found in the main crater of Mount Batur. 02.00 Pick up time at Kuta, Nusa Dua, Sanur Area. 03.00 Pick up time at Ubud Area. 04.00 Start Hiking from Starting point. 06.00 View point to witness beautiful sunrise. 07.00 Exploring the main crater of Volcano. 08.00 Descending down go to finish point. 09.30 Arrive Back at Finish point. 14.00 Arrive Back at the hotel. 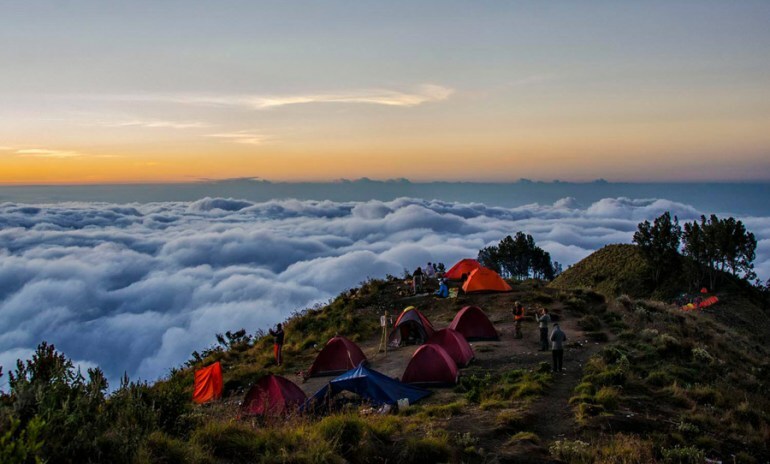 The volcano is located at the center of two concentric calderas northwest of Agung volcano, the southeast wall of the inner caldera lies beneath Lake Batur cone has been constructed within the inner caldera to a height above the outer caldera rim. The 1717 M high Batur start to volcano has produced vents over much of the inner caldera, but a NE-SW fissure system has localized the Batur I, II, and III craters along the summit ridge. in the dark under starlight sky, you will be guided to ascend the slope of Mount Batur, the state of the route is not so difficult to pass. From start point till on the top took 2 - 2,5 hours to hiking. While waiting for the sunrise you will have a simple breakfast (usually egg sandwich and bananas), Witness the breathtaking sunrise overlooking the majestic view of Lake Batur and Mount Rinjani. The sunrise time is the most waiting in these adventures? After all done, then the trip will be continued to visit Toya Bungkah Hot Spring located on the shore of Lake Batur. With a swimming pool where the water is warm, it is very suitable for me recovering energy back. We booked the volcano trekking adventures and it was so much fun. Really really amazing view of sunrise and great experience. Thank you so much Bali Tours for makes this fantastic adventures. 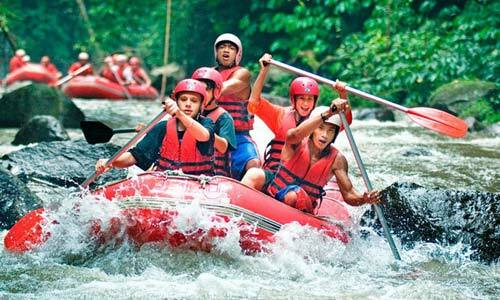 Super amazing adventure and must to do in Bali!! and totally worth waking up super early! Recommendations: Leave from Ubud - you don't have to wake up as early for pick up. You will sweat! Bring an extra t-shirt to change into when you get to the top. If you stay in your sweaty shirt you will get cold. It's cold at the top so wear/bring pants and a jacket. Made the experience even better to hear how a local lives.